#IFBC 2013: Seattle, Here I Come! In less than two weeks, I’m headed to Seattle. I’ll be attending the 5th Annual International Food Blogger Conference in Seattle, Washington from September 20-22, 2013, organized by Foodista.com and Zephyr Adventures. Food makes my world go around. Eating, cooking, reading about it, talking about it. You name it, it gives me a thrill. Three days of immersion in the world of food? I know that being among 300 other participants that share my passion will be the experience of a lifetime. Writing is how blog posts get created. Words and pictures allow me to share the creations of my kitchen and maybe tempt you to try them yourself in yours. Writing is how I comment on the blogs I read, which often sparks a conversation. Over time, these conversations build a connection, and friends with common interests are made across states, countries, and continents. Who knew? Technology seems to be the lifeline of the world today. I’ve been accused of being a Luddite, but I have embraced technology in more ways than one. I love learning more about things I’m interested in and exploring new areas. I’ve always been one for paper, things with pages to turn, like books, magazines, and newspapers. The wealth of information available on the Internet blows me away daily. Navigating this technology from my computer, my iPad, and even my phone, is a new way of life. Though I’ve been blogging for almost four years, this is the first time I’ve ever ventured outside of the comfort of my own home to meet fellow bloggers face-to-face. I’m thrilled and excited, but nervous at the same time. 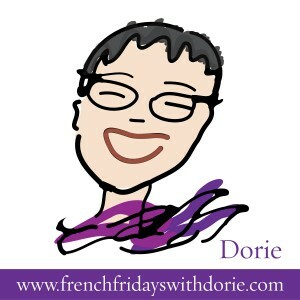 I’m going on this adventure alone, though I will meet up with a dozen of my “cyberfriends” from French Fridays with Dorie. This group of enthusiastic home cooks has been working their way through Dorie Greenspan’s book Around My French Table, one recipe a week. Along with expanding our cooking skills and taste buds, from afar our group has bonded over successes and failures, in the kitchen and out. I can’t wait to put a face and make a real-life connection with each of the on-line personalities I’ve come to know. Exploring the blogs of the conference attendees, I’m look forward to meeting other, as of now unfamiliar, bloggers and making some new friends. The planned sessions look amazing. I hope to gain some new tips and techniques to improve my writing and photography skills to enhance my blog after I return home. I leave for Seattle in just 10 days, and, so, the countdown begins… Maybe I’ll see you there!